The Jeffersonville Public Art Commission, established in 2012, exercises legal authority to approve and site new public art on property owned by the City of Jeffersonville. Site-specific artworks identify Jeffersonville as a place with ingenuity and a great capacity for innovation. These artworks, both permanent and temporary, range from traditional to new media. It is the conviction of the Jeffersonville Art Commission that, in order to support a thriving artistic culture within the city, community involvement shall extend beyond everyday appreciation to meaningful engagement in the creation, evolving interpretation and ongoing care of artworks throughout Jeffersonville. The commission consists of 5 members which reflect various sectors of the community, including representatives from business, tourism, government, neighborhood associations, and other potential stakeholders. The Jeffersonville Public Art Commission envisions Public Art creating positive experiences of Jeffersonville’s historic and contemporary culture throughout the fabric of the city. 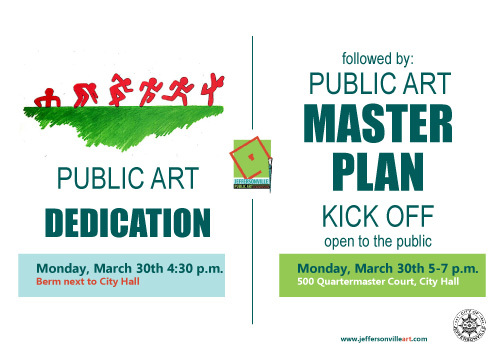 The Jeffersonville Public Art Commission assembles the second Monday of every month in City Hall. We are asking that the public get involved by logging on to jeffersonvilleart.com to take a brief survey that will help to gauge community interest in and support for Jeffersonville’s Public Art Program.